Fish enthusiasts know that with knowledge and dedication, it's possible to keep a thriving saltwater aquarium, a healthy habitat for such beauties as angelfish and clown fish. Mimicking the beauty of the sea in the comfort of your home isn't only for the experienced. You can set up a saltwater tank by purchasing the appropriate supplies from your favorite aquatic retailer. With knowledge and dedication, you can set up a thriving saltwater aquarium. The first step to setting up a saltwater tank is choosing an aquarium. A glass tank is scratch resistant but heavy, and leaking is a concern. Glass also poses a risk of shattering. Acrylic isn't scratch resistant, but is less likely to shatter, although its price point is less attractive. 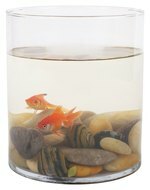 Experienced enthusiasts suggest a minimum aquarium size of 20 gallons, especially for the beginner. Larger tanks and a higher water mass protect the aquarium's inhabitants against changes in the tank. More water means you have more time to get ahead of any problem that might exist in the aquarium. Always rinse your tank to remove any dirt or debris before setting up your aquarium, and be certain to have a sturdy stand or surface to withstand the aquarium's weight when filled. Once you've chosen your tank, you'll probably want a background to mimic a deep sea environment. Backgrounds are available, and if you have a flair for art, you can paint the background on the outside of the tank. Aquarium-safe rocks, such as limestone or lava rock will add to the marine appearance, and can be glued to the tank's bottom with adhesive that is safe for use in aquariums. 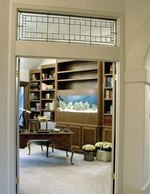 Adding substrate, which includes rocks or sand, will begin to tie together the appearance of your aquarium. Proper substrates for a saltwater tank include crushed coral, dolomite or aragonite gravel. Sand should be used only if your choice of filters isn't the under-gravel style. If you're using an under-gravel filter, install the filter before the substrate and rock. In a natural setting, waste products are easily washed away. In an aquarium setting, a filter is required to perform this job. Install your filter according to the manufacturer's instructions. An under-gravel filter must be installed before substrate or rock is added. Additionally, a heater is necessary to mimic the ocean's stable temperature. Submersible heaters are available, as are heaters that clamp to the top of the aquarium. Install your heater according to the instructions provided, but regardless of the type of heater you choose, make certain the thermometer is visible. The recommended temperature range for a saltwater aquarium is between 75 and 82 degrees. Once your tank is set up, it's time to add water and salt. Prior to adding salt, add a small amount of water to make sure your tank is water tight. To protect your substrate and rock, pour the water into a bowl placed inside the tank, and allow it to overflow the bowl into the aquarium. Remove the bowl. Once you've determined the tank is free of leaks, add the remaining water and a water conditioner designed for saltwater tanks. Add marine salt until the gravity level reaches 1.021. Use a hydrometer, a tool designed to measure the density of liquid, to determine gravity level. Once this level is reached, your tank is ready for a 24- to 48-hour stabilization period and cycling which, when done properly, can take six to eight weeks.